Pope Francis at Varginha. By Tânia Rêgo/ABr. Agência Brasil. “Cérémonie de candomblé sur l’île d’Itaparica” by Lionel Scheepmans. Wikipedia. Trinity Church at Bellingshaussen, Antarctica 2005. James L. Boka. Wikipedia. 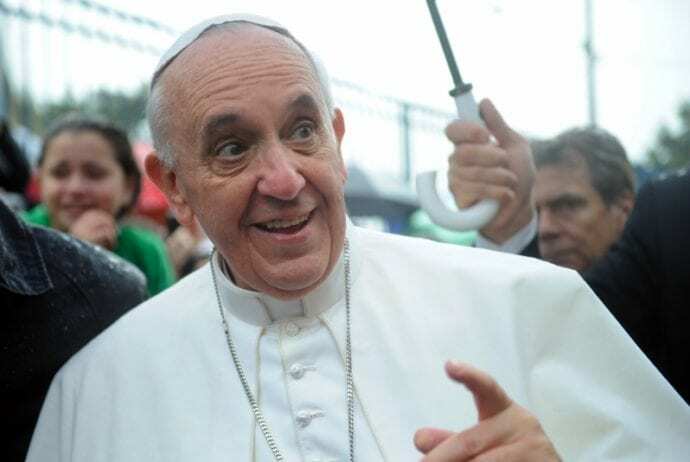 In yet another jolting move to establish the Vatican as progressively in-sync, Pope Francis granted an extensive interview with NY-based Jesuit publication American Weekly (NYTimes excerpts from the interview can be found here). Ranging from personal aesthetic proclivities (who knew Francis was such a big Tupac fan? Just kidding– though his tastes in Wagner’s Parsifal and Fellini’s Roma are interesting) to progressively ambiguous statements about homosexuality, abortion, and the role of women in the church, the interview is worth reading in its entire scope. We here at The Revealer found RapGenius’s deconstruction of the piece a helpfully fun read as well. Religious or spiritual? According to the Huffington Post this week, that question is purely trivial– we are all depressed. Just in case you missed Bill Nye the Science Guy on Dancing with the Stars this week, you can catch him here with Bill Maher re-igniting the ever-present “war” between Science and Religion. NPR ran a piece this week on the “Hidden Religion” of Candomblé, an Afro-Brazilian religion that has begun fighting for recognition and rights of religious toleration from the state. Controversy has arisen amidst a UK’s Muslim-faith school’s alleged requirement for its non-Muslim teachers to wear hijabs, The Telegraph reports this week. It is unclear, however, if the requirement stipulates wearing a hijab khaleeji style, another controversial move present in the UK, Vice interestingly notes this week. Speaking of violence amongst the sangha, the Washington Post this week explored Navy Yard shooter, Aaron Alexis’s, blooming “interest” in Buddhism. Never thought of being an Islamaphobe? Maybe you should reconsider, as it’s becoming a pretty “lucrative business” a recent report issued by the Council of American-Islamic Relations finds. Thinking of getting married but wanting to outdo all of your friends’ traditional shindigs? Consider eloping at the “bottom of the world” at Trinity Church, an Antarctic orthodox church which performed its first wedding in 2007.